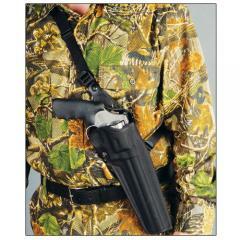 have many shoulder holsters to choose from. DeSantis brings chest carry to the next level with the Black Mamba® Chest Holster Model M40. Weapons like the Smith & Wesson 500 are heavy to tote around over extended periods of time, weighing in at 72 ounces. A Black Mamba® lets users carry large hunting firearms with ease, using the full strength of the torso to bear the load. DeSantis' M40 is constructed from strong, molded nylon for subtlety and durability in one all-utility package. The strap threads over one shoulder and under the arm. It is completely adjustable, employing DeSantis' tension device for maximum comfort. How is the gun secured in the holster so it does not fall out? The holster has a passive retention system meaning no thumb break strap or button. It has a retention screw near the trigger guard area allowing you to adjust the tension to insure a secure fit.